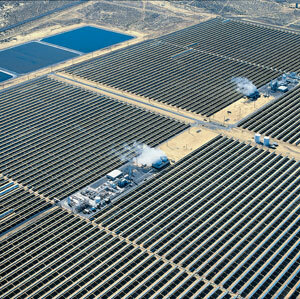 Aerial view of the parabolic trough solar power plants at Kramer Junction in California. 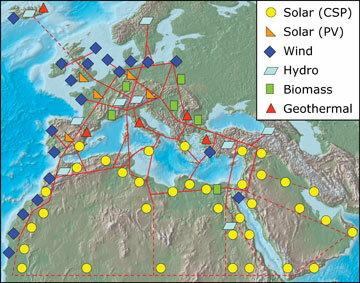 TREC’s vision of a sustainable energy future for Europe, the Middle East and North Africa: A super-grid of solar thermal power plants and other renewable energy sources such as wind, hydroelectric and geothermal fully powers the region. If El Nino and La Nina result from very small changes in ocean surface temperatures, what effect will blanketing our deserts with reflective mirrors do? Is it possible the giant solar farms in the Mojave Desert are creating or stalling a high pressure system and adversely affecting Texas weather? Is anyone else even asking these questions? I am likely too deficient in the languages of meteorology and environmentalism to frame my questions to get a quick result. My Google search turned up too many of the same old, same old inconvenient truths about climate and too few on those of the new technologies. Anyone here know where I can find answers? Donal? Yes, these questions are being asked. Thanks. Made me sort of cross-eyed reading that. Lots of new words and concepts to look up. Donal no doubt knows more than I do, but consider that the purpose of these reflective mirrors is to reflect the sun's energy to a collector. Their reflectiveness is probably less of an issue than the net absorption of energy that occurs at such plants, since deserts already reflect a fair amount of solar energy. Likely true that deserts already reflect a fair amount of solar energy but it is more diffuse and spread over a much larger area. These solar arrays while not as concentrated as those used in solar updraft towers surely must be having some impact on the air currents above them. It's a good question. When I was in junior high school, a social studies teacher told us that a farmer plowing a field could change the local weather - a bit. Likewise, there will be some effect on weather from building an adobe village, a mall surrounded by bituminous parking lots, or a city of glass & stone skyscrapers. Some studies have already predicted climate changes from arrays of wind turbines, and studies like the one Flower cited have looked at the changes in heat absorption due to arrays of solar panels. Usually the changes are dismissed as substantially less than what would happen if coal, ngas or nuclear plants generated similar amounts of power. Wind and solar arrays don't generate as much excess heat as those power plants and don't generate any CO2 (except during manufacture). I don't yet see any indication that the climate change from solar arrays would be any worse than from building a similarly-sized subdivision of McMansions. If that's any comfort. It really isn't, but thanks. Personally, I would prefer that the McMansions come with their own solar collectors. Maybe half the solar footprint and reduce our dependency on giant utilities a bit. The map and notes on TPEC's plans for northern Africa were especially thought provoking. It certainly adds a slant to Europe/NATO's interest in northern African politics. Wonder if deposing Gaddafi* will calm any of those skittish investors mentioned in the article. And just what the world needs, continuing dependency on the on that region for energy. A solar array does not generate heat. It redistributes the Sun's heat that falls upon the array. Without the array, the Sun's heat falls upon the desert floor and is mostly re-radiated within a day or so. With the array of the kind you cite, a significant portion is redirected to the a tower-mounted collector that absorbs the heat and uses it to convert water to steam which drives a generator. In that case, the desert floor itself is cooler than it would be without the solar array, and some of the heat energy of the water is converted to electrical energy. The remaining heat energy in the water is then released back into the environment by a cooling system - maybe a storage pond or another tower, so the heat cycle is more or less maintained and the water is recycled, except that some much of the heat does not enter the desert floor and some of the heat is converted to electrical energy, to be distributed elsewhere. All in all, not a catastrophic environmental issue. It is clear that building a solar array, like building anything, has local environmental effects. The Union of Concerned Scientists (reference) notes that building one 20-60MW utility sized plant requires about a square kilometer of land. I believe I have read that the solar array actually shades about 40% of the land on which it is built, but, of course, the entire area is disturbed by the construction. That's a lot of land, but less land than is disturbed to support a similarly productive coal-fired plant (just think of the strip-mining involved in places like the Four Corners). The shaded area under a solar array, 40% of a square kilometer, works out to about 100 acres. To put that in perspective, a Walmart SuperCenter development including leased out pads, might use up a similar area, with a large portion of it hard-surfaced, covered by pavement and buildings, not counting the Interstate and adjoining surface roads built to bring the traffic. I wonder how many Walmart centers there are in the world? Not to mention all the other similarly-sized non-Walmart shopping developments. Large urban areas create a well-known "heat island" effect, due to the hard surfacing of land, so much of which gets covered with asphalt, concrete and rooftops. The local ambient temperature is a few degrees higher inside the heat island. This does appear to affect local weather patterns, such as the track taken by thunderstorms over and around a city. In southern California, or in the Bos-Wash corridor, the local effects may be additive due to the extent of urban-suburban sprawl. But we're not looking at anything on this scale when we talk about solar arrays. The L.A. Department of Water and Power maintains a generating capacity of about 7,200 MW. If all of that were to be replaced by solar-thermal generating facilities, L.A. would need to build 160 45MW arrays, using up 40,000 acres of land, about 40% of which, say 16,000 acres, would be shaded (not paved over) by the solar collectors. To put this in perspective, urban sprawl in L.A. County between 1970 and 1990 used up an average of 12,600 acres per year (reference), much of it hard-surfaced. So the replacement solar arrays would cover an area equal to about 3 years worth of SoCal sprawl. L.A. County comprises a total of 2,613,120 acres. A couple of notes. First, I haven't directly answered your question, because I don't have specific scientific knowledge of the environmental heat effects of a solar array. Maybe someone who does will read your post and chime in here. And a caveat, it's clear that no solar technology alone is yet capable of supplanting steam, hydroelectric and nuclear generating plants that can operate 24x7x365, unless we can learn to make the sun shine at night, so there are other issues. I do have some experience in land use planning, which is why I put the question of solar energy in a land use context. The impact appears to be relatively small, and relatively benign, compared to the other types of land uses that accompany population growth and urban sprawl. Third, it's all about trade-offs, isn't it? I lived in the Four Corners for 10 years, close neighbor to the San Juan Generating Plant and the Four Corners Power Plant, with a total generating capacity of about 4,000 MW. I would gladly have traded those neighbors for an equivalent capacity in solar arrays. The desert floor being cooler is kind of seems like a red herring. The planetary heat budget is the planetary heat budget. The real question is how much heat has been retained by the global system through all components of the solar power generation process compared to how much heat would have been reflected away from the surface in the natural planetary state. It doesn't matter much if it sinks into the desert floor or if it's absorbed by a big chunk of metal and water ... if the radiation doesn't reflect back to space, the planet keeps the heat somewhere. Red herring? It was not intended to be, but I see how you could reach that conclusion. I was only noting that solar arrays redistribute heat. They rob some heat from the desert floor and redirect it somewhere else. So, the heat stays on planet earth, just goes different places. Didn't mean to argue it was a good thing or a bad thing. It's hard for me to see how a solar array, or even a bunch of them, whether in solar thermal or solar photovoltaic application, would affect the retention or re-radiation of heat on a scale big enough to matter much. But I'm a generalist in this area, not a specialist. So, I think we're in agreement here. Red herring was a crappy word choice - it implied an intent to misdirect the discussion on your part. I just meant in the larger scheme of things the number isn't really indicative of localized/systemic heat absorption. In that regard, using the decrease in surface heat to imply less overall heat is retained is not a sustainable or accurate conclusion. If the study I highlighted below is accurate, it seems for assessing long-term danger of direct heat forcing, as currently engineered solar is a middle-ground technology. Nuclear is apparently terrible on this front (it converts energy that would otherwise be bound in the physical atomic structures of nuclear fuel directly into heat that must be absorbed by the system) and wind/tidal force is among the best. A related thought has been vexing me for a while (mine is related to nuclear and OHC). I'm pretty sure your question boils down to a similar issue: the impact of direct heat forcing on climate. I bugged a legitimate scientist a while back (David Pierce) and he indicated that institutional climate science is not really looking at direct heat forcing in any significant way. He did direct me to the only study he knew of on the topic. It may help with some of your questions as well. ...the excess heat produced by solar power is equal to the radiant energy absorbed by the collector, minus that which the original terrain would have absorbed as part of Earth’s normal radiation balance. Excellent issues to raise. And yeah, it would be nice if more folks could move past the arguing over CO2 game and start to really probe all aspects of the climate question.